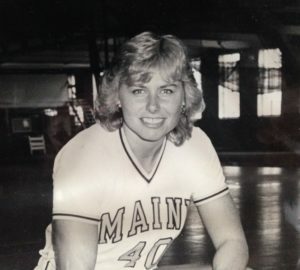 Emily Ellis was a member of the University of Maine team from 1981-85; she came to the university after enjoying a stellar career at Mt. View High School in Thorndike, Maine. The 5’10” center led the Black Bears in rebounding two of her four years and ended her career with 1,637 points and 623 rebounds. Ellis’ 1,637 points rank her sixth all-time in school history, averaging double-figures in her last three seasons. Ellis captained her senior year squad in 1985, leading the team to a 21-9 record, the first 20-plus win season in program history. Following her career at Maine, Ellis played pro ball in both Finland and Austria. Ellis’ No. 40 jersey was the first to be retired by the Black Bears.